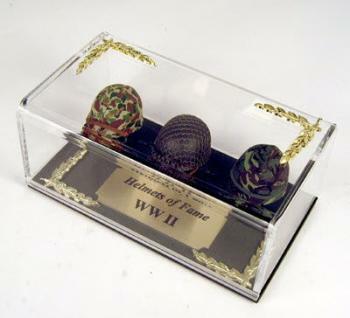 Helmets of Fame WW2 [MHB-005] - $112.50 : Metalcraft by Blair - military gifts and memoribilia. These miniature helmets are very exact in detail and make a great presentation. We have mounted them in groups of their historical being. If desired, we can mix and match any of our helmets to get your desired representation. We also supply the engraved plate for free( this alone is a $15.00 to $20.00) value.